On Friday morning we (the HPSS assessment team) supported our staff to develop their curriculum rubrics. The idea here is that there is clarity from the learning goals of the module through to the individual aspects of our learning design model which formulate the learning objectives to be assessed. We are using SOLO taxonomy as the qualifiers to unpack the curriculum levels. I am so very grateful to the wonderful Pam Hook for her support in developing this approach. Friday’s professional learning was really positive and most teachers were feeling empowered around making the learning clear for their students. Clarity and relevance are essential components of effective pedagogy. If the students (or teachers) are not explicit in what the learning is or why it is relevant, there is the risk of engaging in busy work. Likewise even if the teachers are clear, students who do not understand would simply comply rather than engage in the learning actively. Saturdays are my day off. I often work on Sundays – prep, blogging, marking, providing feedback for learners etc. – but Saturdays are for me. 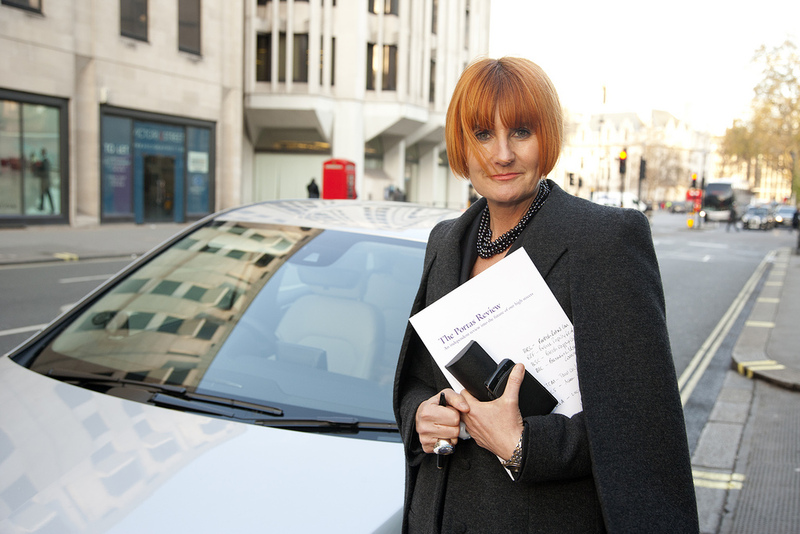 So when I was laxing on the sofa, watching rubbish TV on Sky’s Vibe channel – I stumbled across Mary Portas’ “Queen of the Charity Shops”. In this show, Mary is overhauling a charity shop (in a similar manner to other challenges she has tackled in the retail sector). I was hooked, partly because the volunteers were resistant and partly because Mary’s point about selling were so profound. She talked about the two key things in retail – features and benefits. Features are what makes up an item – be it an exposed zip, 5 inch heels, pleather jacket – whereas benefits are why the shopper wants/needs said item. So as I was sitting there, on my day off, I realised that this could be a useful analogy which we could apply to learning. This is the hook for relevance. So often, especially in secondary schools, students are often learning something for the sake of learning it. Or they don’t know why they are learning it. Or they can’t see the point of what they are learning. What if we, as teachers, were to commit to “selling” the features and benefits of a concept, context or skill in our teaching practice. Heaven forbid anyone read this as “because it is on the test” but instead what if we were to make the relevance clear for our learners so they can make sense of what they are doing and why. So what does that look like then? I’m teaching two distinct things tomorrow. In my learning hub we are focusing on “my learning” or understanding themselves as learners; tomorrow’s lesson is going to be around goal setting. Whereas in my Year 9 module (with a social science focus) which I teach with Tracey, we have a different learning objective altogether. We are learning to “evaluate the impact of Irish migration on American society”. I’m keen to explore with the students the benefits that they see. We could co-construct these as a class or in smaller groups. Both of these benefits will link to the wider educational impact of learning for the individual. It is not about the stuff we are learning; it is about why what is happening in the classroom is relevant for each individual. Sometimes inspiration come from the strangest of places. 1. How did you attend the #edchatnz conference (face 2 face, followed online or didn’t)? I was lucky enough to have the inaugural #edchatNZ conference at my lovely school, Hobsonville Point Secondary School. I was teaching, and therefore part of the conference on Friday, and totally F2F on Saturday. All! And several from my other organisation, NZQA – Steve and Alan as my former NZQA ‘bosses’! 3. How many #edchatnz challenges did you complete? @pamhook – I have had the pleasure of working with Pam before but we had a lovely, critical discussion about the perils of a new school and SOLO taxonomy – these are unconnected ideas! – and I continued to be awed by her. @Melmoore – I felt that I met Mel properly at the end of the conference and it was awesome to connect with someone who has similar ideas about assessment and how it can empower students. I know that we can connect online, which is just as good. – I would have loved to have been able to attend the political debate that @claireamos chaired. I was teaching, which was really cool as well (don’t get me wrong), but it would have been great to have been able to take students along to this as well. Luckily we are having our own political debate next week (student led) with local politicans but I won’t be there. 6. Who is one person that you would like to have taken to Edchatnz and what thing would they have learnt? I would have loved to have my old principal and friend Vicki Barrie there as she is so keen on being innovative in education. Unfortunately she is currently working towards her masters so (rightly so) was busy over the weekend. I would have also loved for some of my fellow Classics teachers to be there – notably Paul Artus! As I teaching on Friday, I felt that I didn’t meet heaps of people I wanted to meet/chat with. While we met, I wanted to hear more from Sonya (@vanschaijik) as I love a lot of what she is doing online. I really enjoyed by brief conversation with Red (@rednz) – want to connect more with him online, wickedly funny guy! 8. What’s the next book you are going to read and why? I purchased The Falconer by Grant Licthman when I realised that everyone else in my office has already read it/ only have an electronic copy. I’ve got a long haul flight on Friday so it may be my reading there. I am also about to read “Lead with Wisdom: How Wisdom Transforms Good Leaders into Great Leaders” by Mark Strom. I purchased this in a bookdepository shopping spree and love that it seems to be a mix of leadership and philosophy. Get more teachers on Twitter! As president of my subject association I feel that my role is to provide links for people and Twitter is a connection to the wider educational sphere. Watch this space! Yes! Absolutely!!! I do this all the time and while it is not a nice feeling at time, a smidge uncomfortable, it is what we need to do. However, we need to be there to support them. This term I embarked on my teaching mission to empower students through using SOLO taxonomy. In my experience SOLO allows students to look at the quality of their understanding of a topic or context or to allow for mastery of required skills. At my previous school, this taxonomy was the lynchpin of my teaching practice ( see my earlier posts here). However, I’m now at a new school so it is time for me to refine what I’ve been doing in the past I see what works and inducting our students at HPSS into this way of thinking about their learning. There are so many amazing teachers at Hobsonville Point Secondary School who are working together in so many ways to empower our students’ learning – helping them to become autonomous, life long learners. I’m thrilled that SOLO is a tool which is seen as being valuable I doing so. Also, there are many teachers here with experience in using SOLO in the classroom that I am looking forward to working with! In the first week of term, I ran students through a workshop which was a reminder about SOLO. This was not the most successful of workshops I have ever run but students seemed to take away the idea of working for a better quality of understanding (relational and extended abstract) rather than doing more of something (multi-structural) and that they could self assess using a SOLO rubric. When working with students in my modules last week, I tried two different approaches to using SOLO to empower learners. 1. In my drama module: students performed a piece of drama and measured their understanding of dramatic space (peer and teacher feedback on this one) then refined their scenes based on that feedback and performs them a second time. Their reflection activity was to consider how they shifted in their understanding of the concept based on the feedback they received. 2. In my Classics module, students self-assessed at the beginning of the lesson to gauge their understanding (of the worship of the gods in Ancient Greece and Rome), the completed some learning activities which allowed them to explore to explore the worship of classical gods and finally came back to the SOLO rubric they had measured themselves against initially and reviewed their progress. I have the students the rubric I had devised on our LMS (we use Moodle) and the students measured where they were using a simple google form – one for the beginning of the lesson and one for the end. All students in the class, bar one, could articulate a shift in their understanding. Some shifts were quantitative (moving from pre – uni or uni to multi) but I was surprised to see how many students could move through from a quantitative level of understanding (uni or multi) to relational. I am keen to explore these shifts with the students in more depth. 1. Keep looking for ways to make SOLO visible in my teaching practice. SOLO has been part of my vocabulary of teaching since being introduced to it as the way to structure learning by the amazing Dr. Ngaire Hoben at the University of Auckland in 2002. I must admit my naievity that I never really realised that not all teachers used it. 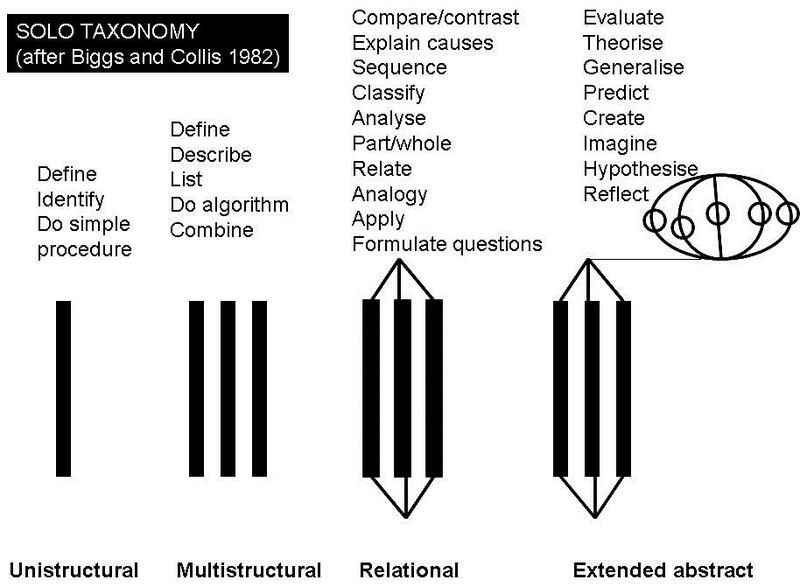 SOLO taxonomy, devised by Biggs and Collis (1982), allows for clear progression of thinking and understanding in any context (John Bigg’s website). The progressions are based on cognitive connections and provides a common language to measure and discuss those abstract connections. The simplicity of SOLO works well for all learners and educators. SOLO works for my way of thinking – it allows for differentiation of quantity of understanding and provides scope to move to more qualitative levels of understanding. What do the students need to be able to show? What does complex thinking look like? How can I help students to move in their thinking? What are the intended objectives? What do I need to do as a teacher to support students to meet these? Learning objectives were clearly linked to SOLO levels – either through explicit linking or through unpacking the LOs through the language of the SOLO levels. My workbooks / learning activities were structured using the SOLO levels. Students could identify where they were at in their understanding and self-assess. Then, discussions were held to move them forward to be able to display progression in the quality of their understanding. Feedback was targeted to SOLO levels – explaining where they were and where to next. As my SOLO journey evolved, I realised that this was still very teacher centred. During my study as part of my Masters degree in Education, I made the natural connection between SOLO and Assessment for Learning. SOLO unpacks the levels of quality – it either stood as the success criteria for a learning activity, series of activities or an assessment, or it allowed for a clear co-construction tool to understand what quality of learning looks like. I ran some workshops for all of the students in the school this week to build on their understanding of SOLO. Links to my workshop presentation here. These link to my professional learning goals of integrating SOLO taxonomy more purposefully to empower students, and building student capacity for reflection and action (in hubs). I truly believe in the power of SOLO taxonomy as a means for empowerment. I feel that I will be blogging about it over the next few weeks and months as my thinking and professional inquiry come into fruition. Students need to be inducted into the ‘guild of the assessor’ this is so powerful for them and makes the talking about learning more meaningful. SOLO is the bombdiggity! It empowers learners to talk about their learning, can separate product from process, or combine them if necessary. SOLO Taxonomy broken down into levels, with appropriate verbs and symbols. Some other links which have helped me….